Ever get to Canada and feel like you need a helping hand? Been there, done that. Never knew about the Newcomers Fair back then … but luckily there’s one just around the corner in October to help people now. “As Canada’s largest event for newcomers, we understand the challenges you and your family might face when moving to a new city or country. At Newcomers Canada we can help you whether you have just arrived or want to stay longer. “Our Fair is not only Canada’s leading recruitment event for foreign-born workers already in Canada, but includes Visa and Immigration Advice, Career Services, Education and English Language Testing, Foreign Credential Assessment and Settlement Services. It’s free to pre-register online for the whole shebang, so check out this page for more information. 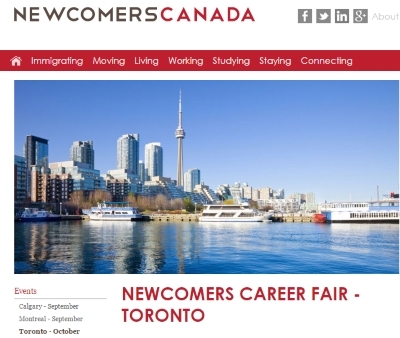 This entry was posted in Uncategorized and tagged brits in toronto, newcomers canada, newcomers toronto fair on September 11, 2015 by britsintoronto.